The wide cringe of Ceiling Air Grill are precision engineered using the advanced technology and are designed for installation in the sidewall, floor and ceiling and are specifically crafted for rendering heated, ventilated or cooled air and for the return air or exhaust air. These Grills are manufactured from a high-quality Aluminum extruded section with powder coating to give a durable performance and corrosion resistance. We quality test this product, before delivery to our clients. This range is extensively used in diverse domestic and commercial sectors. Our range is available to clients at competitive rates. With volume control damper & Double deflection type. Double Deflection Grille is being manufactured with us. Most desirable for supply air inside-wall locations. With aerofoil shape louvers in both horizontal and vertical direction, minor air motion problems can be quickly corrected by adjusting the vanes. An opposed blade damper installed behind the grille is used for adjusting air volumes during air balancing. 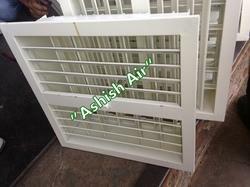 Choice of horizontal louvers in front and vertical at the back or vice versa available. 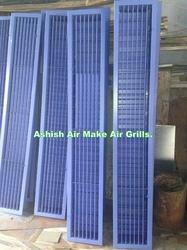 Looking for Air Grills ?